Before you can raise animals on your farm, you'll need to fix up their living arrangements. There is a chicken coop and an animal barn already, but they are in bad shape and need repair before you can house animals inside of them. The chicken coop requires 20 Softwood Lumber, 7 Material Stone, and 1000 G. The animal barn requires 30 Softwood Lumber, 10 Material Stone, and 1500 G. The Material Stone won't be available until Gus moves in as you work through the third lighthouse tablet, which unlocks the mine and awards you with a hammer for collecting raw stone. Gus' forge can turn 3 stone into 1 Material Stone. You'll also need to entice the animal dealers to return to Beacon Island. There is a bridge in the mountain area, close to the entrance leading to your farm, that requires 5 Softwood Lumber, 2 Stone (the raw material), and 600 G to repair. Once the bridge is repaired, you also have to repair Sofia's Livestock shop by using 5 Softwood Lumber, 10 Material Stone, and 300 G. The next day, walk into the mountain area to meet Max the dog, Michael, Gabriel, and Sofia. The next day after that you can shop at Sofia's Livestock from 6am until 4pm. Her shop is closed on Sundays. The wild bobcat can become your pet once it reaches max friendship and you upgrade to the Large House. While the pet dog is used in the Dog Race festival (and nothing else), the cat is just for show (pre-2.0 patch for PC version) or can randomly restore a half-heart of stamina when you pick it up (Ps4, Switch, and post-2.0 patch). After your first purchase, Sofia will give you a Pitchfork to pick up Compost that will randomly appear on the barn floor, a Brush to keep the livestock animals clean (chickens don't require brushing), and 10 Animal Feed. She'll also give you a Milker with your first Cow purchase, and Clippers at your first Sheep purchase. You can buy additional Animal Feed at her shop for 30 G each. If an animal get sick because its stress level is too high, she also sells Animal Medicine (5000 G) and Chicken Medicine (3500 G). Buying the horse will reward you with the Horse Whistle, which will call the horse to you where ever you are outside. After you buy your first cow you'll also unlock Calvin the Harvest Sprite. You can use Calvin's abilities to herd the livestock animals out of their barns. A yellow herding bell will appear on the outside of the Animal Barn after Calvin appears. A bell will be on the exterior of the chicken coop as well, but you can only have one group of animals outside at a time; either the chickens are outside or the livestock are outside. You're out of luck if you want to keep the animals within a certain area on your farm. Doc starts to sell Wooden Fence for 3 Softwood Lumber, 1 Iron, and 300 G each after you buy a livestock animal. 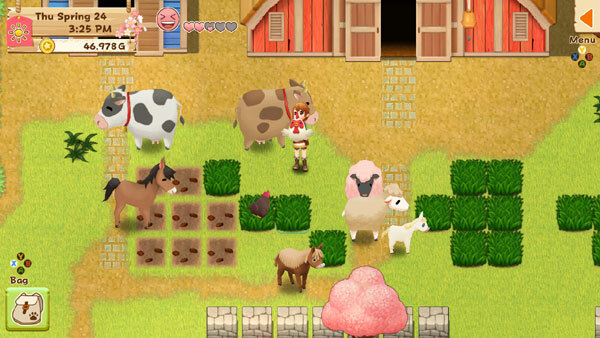 Even though you can place fence out around your area, using the bell will herd the animals out into the farmyard in a preset location; you can't control where they are placed and they will wander all over the western area of the farm. You can also breed animals. For chickens, just place an egg into the nesting box inside the poultry barn. It will take 5 days to hatch, and then the standard 8 days for the chick to mature into a chicken. For cows, sheep, and donkeys, you'll have to buy a Miracle Potion from Sofia's shop for 8000 G. The pregnant livestock animal will sit in one of the wall stalls and cannot be fed or moved outside. It will give birth after 7 days. Baby animals start out with 0 friendship notes (i.e., they do not carry over any friendship from their mother). Since a standard cow costs 7000 G and the Miracle Potion costs 8000 G, you'll save money by buying your cows rather than breeding them. 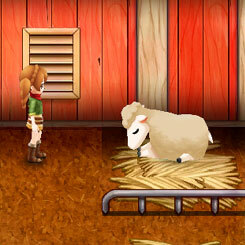 You need to have room in your barn for these new animals to appear in Sofia's inventory. Doc will sell a Big Animal Barn upgrade and a Level 2 Chicken Coop upgrade after you finish the storyline. The Big Animal Barn can hold a total of 15 livestock animals and costs 120,000 G, 30 Hardwood Lumber, 3 Mithril, and 2 Adamantite. The Level 2 Chicken Coop has room for a total of 15 birds and costs 100,000 G, 20 Hardwood Lumber, 3 Gold, and 1 Adamantite. Adamantite Ore appears in the mine starting on floor 60. You'll need 3 Adamantite Ore to process into 1 Adamantite at Gus' forge. The higher your friendship, the greater the chance of producing higher quality goods. Chickens and cows will produce goods every day. Sheep and donkeys will produce fur every three days. Cows and chickens will produce goods every day.